Okada America Inc.’s pedestal rock breaker boom systems are mounted at primary jaw, impact and gyratory crushers and stationary grizzlies and are used for crushed stone, hard rock and ore reduction and C & D recycling applications. Okada America Inc.'s pedestal rock breaker boom systems are mounted at primary jaw, impact and gyratory crushers and stationary grizzlies. They are used for crushed stone, hard rock and ore reduction and C & D recycling applications. And, they are designed specifically for stationary primary crushing plants as well as mobile and portable plants. All rock breaker boom systems include positioning pedestal boom, ORV Series hydraulic impact breaker, electric power unit, operator controls, first use start-up and commissioning including operator and maintenance training. Available options consist of premium and radio remote controls, pan-zoom camera system with either coax cable control or fiber optic control and integrated package with rock breaker boom system, power unit and operator's cab mounted collectively on an upper carriage platform. 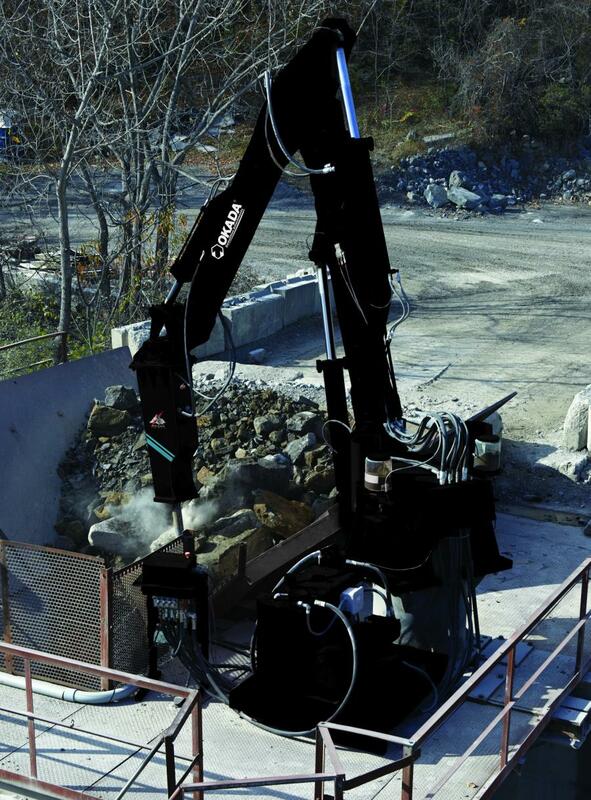 Okada's own ORV Series hydraulic breakers, mounted on the rock breaker system boom, range from 375 to 7,500 ft. lb. impact energy class. In addition, they can be used for mobile excavator mounting pit hammer applications. Choice of 24 rock breaker boom system models with a horizontal reach of 10 to 40 ft. Choice of 10 box-housed ORV Series hydraulic breakers with impact energy classes ranging from 375 to 7,500 ft. lbs. Choice of 6 electric/hydraulic power units ranging in size from 20 to 125 hp that appropriately provide optimum breaker power. All electric/hydraulic operation with optional electrical enclosures with start/stop control, circuit protection and indicators for maintenance. Engineered site assessment for proper positioning boom selection, breaker size selection and safe working range assurance. Optional premium and radio remote controls. Optional pan-zoom camera system with either coax cable control or fiber optic control. Optional integrated package with rock breaker boom system, power unit and operator's cab-mounted collectively on an upper carriage platform. Okada pedestal rock breaker boom systems provide the means to maximize the rated capacities of crushers. They also provide a safer method to alleviate blockages at the crusher caused by oversized, wedged and bridged materials. For more information, visit www.okadaamerica.com.